Pushing boundaries and experimentation are welcome features of the craft beer world. And, arguably, the one experiment to have been most widely tested by brewers in Australia in recent times is that of the New England IPA. In some quarters, the hazy, juice like style has been galvanising and, in others, polarising, but almost everywhere it has sparked curiosity. That’s certainly the case in Mona Vale where the Modus Operandi brewers have released several different versions of the style, each of them markedly different to the next. Having just added two more – Gadzooks! and Tropical Contact High – it seems a good chance get up to speed with where they’re at and why they’re doing it. In summary, for the brewers it’s about science and curiosity rather than getting on board with a trend for trend’s sake. For them it’s about what you, the drinker, can’t or won’t see in the haze; how they’re altering water chemistry to deal with reduced bitterness; how an early hop addition here stands up to a late hop addition there; whether a new experimental hop has viability for future beers; how conventional thinking might not stand up when you're playing in different territory. They’re using what they know to work out what they don’t, and the results are fun for everyone. As that relates to the beers at hand, both are most notable for being very hazy and very forward with tropical fruit and citrus characters, which is a given, given the style. Of the two, Gadzooks! is slightly lower in alcohol but feels like the more robust in construction with no less than six hop varieties – Cascade, Centennial, Galaxy, Mandarina Bavaria, Mosaic and Idaho 7 – thrown at it. The place they land is where mango, citrus and passionfruit characters meet dankness and bitterness. 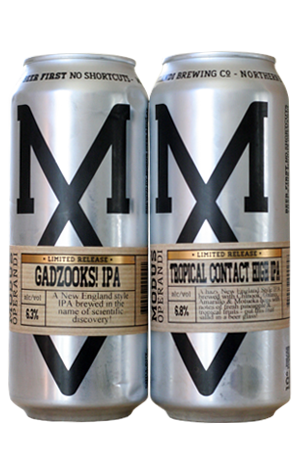 Tropical Contact High has fewer and mostly different hop varieties – Chinook, Galaxy, Amarillo and Motueka – which seem to have all unified under a big burst of pineapple. TCH is the more classically balanced of the two, with less outright bitterness and a creamier mouthfeel, and is the kind of fruity concoction you could imagine sipping from a cocktail glass on a desert island. All in the name of scientific discovery, of course.